Source: CNN – AFP – Reuters – Adamowicz giving a thank you speech for the participants to the charity event right before the lethal attack. It’s Sunday 13 January 7.55pm. I am recovering from a terrible cold so I am winding down in the sofa with my Polish lifepartner. 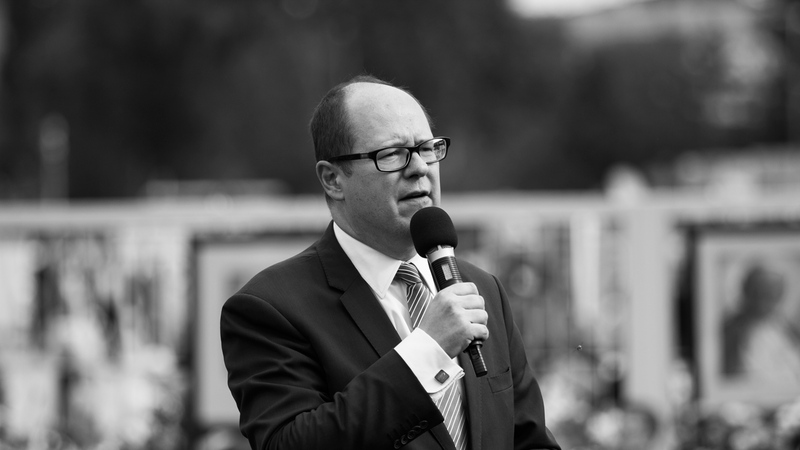 A bit later, I am hearing her shout in disbelief as she was staring at her mobile: social media reported that the Mayor Paweł Adamowicz, 53 years old, was knife-stabbed into the heart on stage during the finale of the Great Orchestra of Christmas charity event (WOŚP – Wielka Orkiestra Świątecznej Pomocy). This annual charity event aims to help raise funds for brand-new medical equipment for children’s hospitals. Just like the hundreds of thousands of people I was deeply shocked hearing what had happened: a 27-year-old man with a history of bank robbery found his way on stage and lethally stabbed the mayor more than once. The madman shouted that because of the mayor and his political party, he was unjustly convicted. Some minutes later he got apprehended. Meanwhile the rescue services hastily tried to stabilize Paweł’s condition waiting for the emergency services to take him to hospital. Doctors immediately initiated a rescue operation of 5 hours. A long queue of people lined up to give O Rh Minus blood type. Medical sources stated he received as much as 18 liters of blood as he kept losing blood during the operation he underwent. Adamowicz was a former member of Poland’s Civic Platform, a centrist party. For more than 20 years he served as Mayor of Gdańsk. He recently was reelected as independent. During his time in office, he was known as a liberal. The fact that he always supported minorities, refugees and the LGBT-community reflected on the of Gdańsk: it is known as an open city, a truly nice place to live that fits in perfectly well in the culture of Tricity. Source: EuroNews – Thousands march to commemorate Paweł’s death. Gdańsk’s born Jurek Owsiak is the founder of the Great Orchestra of Christmas event. In recent years he was the person to criticize the right wing conservative Law and Justice (PIS) party. Therefore, he was hated and frequently targeted by the right-wing party claiming that such charity should be organized by the church. There were various initiatives to undermine this privately organized charity event which on every occasion beat records. This charity event was no exception as it generated a staggering PLN 92,143,798 (around EUR 21,000,000 or USD 24,500,000). As result of Adamowicz’s death, Owsiak resigned as head of the charity foundation faced criticism regarding the security on stage. This criticsm is nothing new but now it seems that his opponents have received the means to put him out of business on a silver platter. Nevertheless, he stressed in a statement to the audience after the attack that the organization will continue its work. Paweł Adamowicz who had been in office for more than 20 years attended regularly charity events. He thanked the people who had helped raising funds. Police sources stated that the attacker had a ‘Press’-badge which enabled him to enter the stage. The investigation is ongoing. Thousands of people gathered in the streets, marching with a clear message: ‘Stop Nienawiści‘ (‘Stop hatred‘). Aleksandra Dulkiewicz, Adamowicz’s deputy mayor, asked to please not politize the stabbing. Years ago Adamowicz already claimed to have received death messages. When asking the police to investigate the death letters he had received, nothing happened. I have been living for 9 years in Gdańsk, Tricity (Poland) and I can tell you sincerely, it’s good living here: there are regularly expats meet-ups, the sea is not far away; The air is clean; There are nice trail paths in the nearby forests; You don’t have to go far to relax at lakes; There are lots of activities all year round; lots of things are happening to improve the city-life; Even taking into consideration this horrible event, never did I feel unsafe while walking in the city centre, etc. In short, the happiness factor of living here is very high! Of course my situation as an expat may not be the situation of someone else’s but if you may believe various sources, Gdańsk is one of the best places to live. The Tripadvisor 2018 Travelers’ choice for example, mentions in its Top destinations on the Rise – World, Gdańsk on the 5th place! All of this are part of his achievements, his savoir-faire to put Gdańsk in the picture. This year I hoped to meet Paweł Adamowicz personally to have an interview with him and publish it on the traveltricitypoland blog. And now I am publishing this article to his tribute. My way to process this event, is to write it down. Maybe it is inherently to what blogging is all about: writing down your emotions and providing your personal expression and opinion. So let this article be a an article of hope and mutual understanding! I hereby convey my most sincere condolences to his wife and his both children (9 and 16 years old).